Homework is bad for your family, say researchers, who have found that it causes arguments and upsets. A study of the impact of homework in different countries says that the pressure of homework causes friction between children and parents. This pressure is worst in families where parents are most keen for their children to succeed at school. And the survey claims that homework causes "anxiety" and "emotional exhaustion". As a solution, the report suggests that "homework clubs", which take place after school, are a successful way of getting the benefit of homework, without risking the disagreements associated with homework at home. The report from the Institute of Education in London is a review of research over 75 years, which examines the impact of homework in the United Kingdom, the United States, Europe, Australia and the Far and Middle East. And it says that homework can become a source of tension, particularly when parents try to take too much control of how children are approaching their homework. For parents to make a positive contribution, the report suggests that parents should take a more supportive and less interventionist role, only helping when they are asked. "Parents have the most positive influence when they offer moral support, make appropriate resources available and discuss general issues. They should only actually help with homework when their children specifically ask them to," says report author, Susan Hallam. The report backs the effectiveness of homework clubs, which have become popular in many schools. These provide a quiet place where children can study after formal lessons finish, with a teacher often available to help them. "Homework clubs give children the benefits of homework without the rows at home. 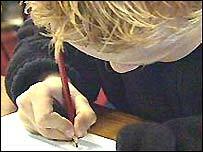 Children feel they make homework enjoyable and give them a better chance of passing exams," says the report. "They may assist in raising standards for those who need extra support or who find it difficult to do homework at home. As such, they help to bridge the gap between the haves and the have-nots." The report also says that the impact of homework on academic achievement is "relatively limited" compared to other factors, such as "prior knowledge, ability, time on task, good attendance at school, motivation and self-confidence". People seem to forget what homework is for. Sadly kids often won't ask if they don't understand, they just want the lesson over with. The best way for a teacher to see who is struggling is to set homework. When I was at school, you didn't get in to trouble for doing your homework but getting it wrong; far from it, the teachers offered us extra coaching at lunch and break times to help us catch up. You only get in trouble if you are too lazy to do the work set. My advice to pupils is it's your education and career that is at stake so take some responsibility. The only time pupils have been up till midnight and wearing themselves out on homework is when they had it for two weeks and decided to do it all the night before it is due in, because they wanted to do other things in the evenings. Hello? Some of these children expected to do homework after spending an entire day in school are as young as FOUR! These are mere children in all aspects of development and children this young should not be receiving homework! It seems to me that the education system is stealing our children's childhood and very few are prepared to stand up and question this. There is no way that a four year old or come to that a nine year old needs to learn about adult work schedules and commitments - this is the time when they should be learning through play and discovery not sat at a table just because it may be expected of them during their adulthood. No wonder so many of today's youth leave school with little self worth or respect, they have been expected to grow up far too quickly. If it weren't so sad, some of these comments would be funny! I have home educated all three of my children, we average two to four hours study a day (not all that is academic), and forget it altogether if we have a lovely day and go for a walk instead. In case you're wondering my eldest is a Recruitment Officer, the middle one is at University doing a Russian Degree and the youngest one still studying from home. Home Education must be the only time homework doesn't cause stress. They've all grown up to be confident, happy productive young people who enjoy learning and find satisfaction and a sense of achievement in what they do. Come on! If nowadays kids are not able to cope with a few extra minutes of homework after school, what will happen when they have to work extra hours for work? I think we are creating a nation of lazy and idle people. Children are now "psychologically distressed..." For God sake, let's stop that: we are creating problems that don't exist. Let's stop analysing things and start working. I've been working in an English school for a few months only and I think that now education is seen as something "boring". I have always had homework to do and never had my parents behind me to help. What matters now for kids is to play with their brand new mobile phones. Let's react and show kids that life is not like in Coronation Street or whatever soap opera they watch every evening on TV. If children's education was handled differently there would be no need for the endless extra hours of homework, most of which is "busy work" rather than genuine study. Many home educating families will witness the fact that their children don't need to be "schooled" from 9am to 3pm every day in order to "keep up" with children within the school system and they certainly don't then need to sit alone for a couple of extra hours in the evening doing more work! If these children can succeed with unqualified parents teaching them for a few hours a day, surely schooled children could do the same if the teachers were free to teach without being slaves to paperwork and targets? I am a parent of two 15 year olds (soon to be sixteen) who are both studying for GCSEs. The girl knows what she needs to do and gets on with it, but the boy just has a real attitude when it comes to revising for these exams. I am constantly saying to him have you done this, have you done that, I try my best to encourage them both so they do not lose grip of what they need to do so I personally could not wait until I am asked for help. They are also on a school programme 'Reaching for a C' which they both attend after school. Whatever happens I will continue to encourage them both, but I will not continue to nag. Better quality of life = Happiness and good health all round! Get rid of the stress, do not add to it. Life is there to be enjoyed, you get one shot at it. Give the kids and us a break. If there is less homework, surely it would also encourage more people (i.e. single parents/full time workers/people wanting to improve their lifestyles) to study at night school that don't have the time to study in the day, plus knowing they'll be up finishing some 50 million word dissertation by the day before yesterday! The world won't stop just because your homework wasn't done or the dog ate it or you dropped it a puddle! Remember those?! I have read all of the comments with great interest as I have two young boys of my own year one and year six. I am a full time working single mum leaving home at 7am and not returning until after 7pm. Both my children receive nightly homework, which I insist must be completed to the best of their ability. Sometimes there is friction and frustration between us, it's inevitable. Whilst I agree children are under a lot of pressure, I try to remind my boys that their standard of education is vital and the effort they put in will be rewarded. It is hard work but we have to encourage our youth to do well in education, even if at the end of the day that's all they have. Except of course for love and support. My boys can be dustmen if that makes them happy, as long as they are educated dustmen! Homework Clubs are a great idea, but are not new. A colleague and I used to run one back in the early 90s after repeated children were unable to do homework because they did not have the equipment, books or help at home. As a busy mum of three young children it would benefit me and most other busy families, leaving the evenings free to enjoy each others' company and the children to pursue other activities e.g. sport/ brownies/cubs etc. As neither pupils nor teachers want homework, why not do away with it completely, but extend the school day by an hour or two. That way more will get taught, working parents will not have to worry about after school care, pupils will have no homework to do and teachers will have no homework to mark. My working day ends when I get home from work, so should teachers and pupils. I went to a school which had boarding and day students. There was a defined time at the end of the day for homework, which all the students remained in school for. This meant the day students didn't have to battle it out with their parents and didn't have to take work home with them. It also made book sharing and group work much more easy to organise. The added bonus was that by the time we got to university we were used to settling down for a couple of hours work in the evenings. I'm amused by the suggestions that kids need a routine. When I was sitting my Highers, I got in at 4pm, worked till 6 (teatime), started again at 7 and finished around midnight. Every night - including Fridays. Saturdays I would start at midday and do 12 hours again. Sundays - sometimes I would have to help my mum with the shopping and I hated that because the time lost often meant I wasn't finished till 3am. Yes, that was a routine. I got so little sleep and was constantly under such pressure of work that I was always sick with whatever bug was going around, I stopped growing and became anaemic. I also developed anorexia due to academic pressure. If that's the kind of routine that the majority of parents think will do their kids good in later life, I'm very surprised. My cousin was a secondary school teacher for many years and point blank refused to set homework for any of his pupils. He didn't see the point in it. If it can't be done at school, why should it be done at all? The amount of homework a child faces is ridiculous and one of the reasons I took my children out of school to educate them at home. These are children! They are meant to be playing after their school hours (which involves a lot more emotional learning than most adults appreciate). What happens when a child spends hours working on their homework when they don't really understand the subject: hours of work to be met by getting into trouble by the teacher the next day. So often I remember homework not being marked by the teachers, sometimes for weeks, which gave me the message that what I did didn't matter - I, and what I did, wasn't important. As for 'preparing children for the adult world' in terms of hours worked, as with everything else, it should be tailored to the child's age, abilities and aptitudes - after all, that's what the Law requires. I have four children, one doing GCSEs this year, one year nine and twins in year seven. Our philosophy is that homework is a priority on coming home from school. This has been the same throughout their school lives. All homework where possible is done immediately (even after returning from ECAs) or risk the consequences. Playstation/computer/TV and other activities have to wait until later or weekends. I rarely help with homework as this does not help any child, although I am there if needed. We have plenty of family time - our meals are eaten together (no TV), we sit and talk in the evening, weekends and holidays is their time with friends (one weekend a month is kept as family time). Even as a full time working mum and dad this was the same. My kids still have their jobs to do too! Plenty of time. Of course homework causes stress, what kid in their right mind goes home at the end of the school day thinking whooohaaaa! I've got homework to do. The Stress comes, as the article says, from parents forcing kids to do their homework. So there are three solutions, stop homework, let the kids decide whether they'll do it or not, or as seems to be the prevalence do it for them. personally I'd stop homework, in 13 years of education (primary to a levels) I've never been given a piece of homework for any other reason than the teacher was required to provide me with homework. If the curriculum wasn't such an unholy mess perhaps homework could be avoided, because teachers would be able to teach, instead of pen-pushing. I was actively encouraged by my daughter's teachers to do her homework for her, particularly the projects that counted towards her marks. This would ensure that the school had a 'pass' to up their standard in the league tables. Other parents have told me the same story. I admit, I did it to help my daughter. How many other parents will be as honest? Perhaps then homework can be shown for what it is; a way of improving student standards by allowing their parents to do the work. For goodness sake, it's only a couple of hours of unsupervised study - we've all done it and have not been psychologically scarred by doing so. If they were not doing homework what would they be doing? Probably spending an extra couple of hours watching mindless TV or playing console games. If we continue to molly-coddle our children, we will end up with a nation of sensitive, wet adults unable to think for themselves and unable to cope with anything! Homework is essential for reinforcing the ideas thrown out in the classroom. Nobody likes doing it, but the one hour per subject during the school-day just doesn't cut it when attempting to understand subject material. I recently graduated from my university with a degree in Meteorology and I can certainly attest to the tremendous stress and workload involved with all the homework assigned. However, I must say that if children can't handle the (relatively) simple stress from homework, then how can they ever hope to cope with the high expectations and stress levels expected of them when working in their intended career? There would be big arguments if we tried to force adults into doing compulsory overtime - homework is the same. Kids have a long day as it is. Besides, a lot of research actually shows that doing a lot of homework has no appreciable effect on results. Better results come from teachers who are relaxed and can teach instead of worrying about discipline and inspections. I'm 17 years old so naturally I have a part time job. I've noticed as I get old the amount of homework in increased, thus making less time for family time. I think it's the teacher's job to teach because they're being paid for it. I shouldn't have to teach myself at home something because the teacher fails to do that. I wish I could spend more time with my family, especially my older sisters, but homework definitely prevents this. I am a teacher and a parent. I have arguments at home about my son's homework, and have to sit in on endless detentions at school for lack of homework. We should give up on homework as a bad deal. Nobody gains from it. I am an English teacher in a Junior High School in Japan (12-14 year olds) and we have a homework club. It doesn't work. All it does is take up more of the teachers precious time and make the students do homework straight after their lessons have finished, instead of giving them a couple of hours rest so they can do it when they are ready. Children DO have to take responsibility for their actions. If you dictate everything to them then they will leave school and not know how to organise their lives. Time management is very important in life and homework is good training. Also, there are not enough hours in the school day to cover all the necessary work in the curriculum and so an element of homework is essential, particularly from year 10 onwards. Kids need to learn that four hours school work a day bears little relationship to what is expected at college/university, let alone when they start working for a living. Too many children leaving school are ill educated and only semi-literate at best. It is far easier to learn when they are young and is time well spent. My daughter starts school at 7.30am and is dismissed at 2.45pm. By the time she gets home she is done with school. She is 10 years old and all she wants to do is play with her friends. The there is the after school programmes, as sport id good for them. With homework we are stressing out kids way too young. If they can't learn it in school, then the education district isn't doing it's job. I never did like homework. I believe most of school is pointless busywork, anyway. Homework should be abolished, and lectures/coursework should be of a higher quality. Do you work 15 hours a day without pay? Most high school students question the value of their education anyway. I never finished high school simply because of homework, but I turned out all right. Ironically though, that now that I'm in post secondary, I do about five hours of homework a night by my own choice (IT training Certification). Surely the starting point is to ask what is the purpose of homework? Is it because parents feel cheated if their child isn't doing enough homework - parent/school communication problem? Is it to finish work not done at school? Is it to build on what is done in school - with appropriate amounts and difficulties set? Or is it, just perhaps, to start to instil the discipline that, regardless of distractions, sometimes work just has to be done - and you have to plan how and when to do it. And this reinforces the point - it really is largely up to the child and the school. Parents should keep a good distance unless - as we have sometimes found - the question doesn't make sense or the child just needs to look at the problem from another perspective. Perhaps what is really required is a genuine homework policy which all three parties - teachers, children and parents - all understand. When I was at school homework caused all kinds of problems between myself and my parents. They were constantly on at me to do work or revise or something. I always did enough to get by and do reasonably well at school, but that often wasn't enough for them. Now I'm in my final year at University and everything is going well. Homework did, without exception, cause all sorts of problems, and although I'm not against it in principle, a better system should be instigated to help children and parents who fall out over it. Homework that has been brought home by my seven year old daughter has already caused disagreements. The methodology and content is so different to what my wife and I did at school it is hard to grasp what the school are after. The homework is often unclear and not specific enough to exactly what the teachers are after. Is it really necessary at this young age? Can't they just enjoy being kids? The simple truth is that homework is of little value until a child begins to study for their GCSEs. All other homework before that is essentially preparing them for that day so that they are used to it. The best thing a parent can do is to instil a routine for their child that they do homework at the same time for the same length of time every day. Then when it becomes important they are used to applying themselves. Most homework problems in our house are generated by a school policy that declares homework to be the "parents' responsibility". To me, it is very clear and simple: if the school wish to set homework, then they should enforce it and sanction non-compliance accordingly, not buck-pass. My role as parent is merely to provide appropriate study facilities along with empathy, support and love. Why do we subject our children to stress that we couldn't cope with? If the impact of homework is "relatively limited" why don't we scrap it altogether? How would it be if people came home from a stressful day at the office with three hours of work to do at home away from their families? Why do we subject our children to stress that we couldn't cope with? They should be learning how to relax! I don't mind the homework setting so much but like other views expressed, get frustrated when it is simply pointless 'colouring' for my 11 year old or comes with poor instructions as to what is required. Both my husband and I work full time and finding the time at weekends to create the routine of 'homework time' for our eight year olds is difficult as the children are at an age when their homework has to be supervised. At times this has been a stressful 45 minutes or even an hour. Given the research view that the value of the work that they do in that time is minimal, I am questioning if this is really worth the hassle? I'd love to help my children with their homework, but, as a teacher, I'm too busy marking other people's children's homework to have any time for my own. How's about that for irony? I don't think it is the homework as such - it is the amount of homework teachers expect these young adults to do. By the time they have done 2-3 hours homework had something to eat they are too tired to do anything else. As working parents would we be expected to do the same for our employer before we can do the essential things, like running a house interacting (as it is now) with our children and have the social life we crave for? No. so why make these demands on our teenagers? I am not saying NO homework just be a little less demanding on them. After all a good rest is half the job as we keep telling them. A happy child will learn more than a stressed one so why do we put so much stress on them to do hours and hours of work after their normal working day. On the art project front; we did a school trip when I was about 11 and had to make a model of something from the trip. Year on year these models were handed down. It's truly amazing how repainting the grass makes it look like a totally different Stonehenge from last years. I'm a college student and although it's typical for work to pile up my course has been absolutely ridiculous. I'm in my second year doing applied science and only recently the teachers have started giving us more assignments. This has put a lot of pressure on me and my classmates, for example two of my classmates are working mothers and find it difficult to cope doing both. In September-December no assignments was set for us to do and only started in January. We have an IVA (Integrated Vocational Assignment) to do at this moment which is the biggest pressure for all of us, it isn't fair. Yep, got to agree with you there. I'm currently studying at University, and I'll be sat at my computer, head right in the middle of something, when my Sister, who is doing GCSE's back home, phones up or comes on MSN, then I'm expected to drop everything to give her a hand with something that she's had for a week which is due in the next day, thus putting me off my train of thought, if Tony wants a life line, he'll kill off Homework, or if the Tory's want a decent landslide victory, they'll promise to do it, and by thunder they will, save our souls, sanity, and various other aspects from the dreaded homework beast. I try to help my daughters with their homework in a constructive way. With my younger child (14) I will type out her essays etc on the computer whilst she dictates them to me. I don't change what she says, I just type it out verbatim and leave her to do spelling and grammar checks and put the punctuation in when it's finished. With my older daughter (17) I help by discussing her work with her. Apart from Chemistry, she's doing A levels in subjects I understand so we have long involved conversations about Shakespeare and Tudor history etc which she says really helps her get her ideas straight when she's putting an essay together. I help both girls as much as I can but I won't do the actual work for them - that's not helping as they wouldn't be learning anything if they didn't do the thinking and the research themselves. Personally, homework was a living hell for me. Our house was overcrowded and constantly busy but worse than that my father was retired and "devoted" all his attention to me. He had a two year disagreement with my maths teacher over methodology for algebra. Sunday afternoons were spent with me weeping by the side of his chair as he drew red pen through my work and re-did it in the back, accompanied by a two page letter to my teacher explaining exactly where he was going wrong in his teaching. The result of this is I am completely maths-phobic - can't even play card games as my brain freezes up. My son has just started school and he loves his homework. He feels really important carrying his reading books home or his maths folder, of course he's only four and a half so the workload is light and the emphasis is on enjoyment but I am determined not to repeat history and leave him with sad memories. Ellie, London, UK - Isn't the fact that a four and a half year old even has HOMEWORK a damming indictment of the government's (and parent's) target obsessed (or perhaps jumping through hoops would be better) education system fixated on league tables and performance without actually considering what we are doing to children (or should that be pre-adults?). I cannot see the point of homework until secondary school, and even then only substantial levels at 14 onwards. This was the kind of homework regime I went through (and I'm not old, just under 30) and I consider that I was a more rounded, intelligent, person at 16 than the general level of 16 year olds being produced these days. Good teachers are the key - not homework. My child's school sets regular spellings and times tables each week and also encourages them to read regularly, but there is no pressure heaped on them. They then have an optional homework menu each term which has creative ideas for science, geography, IT, music, PE, Art and DT projects that they can do at home. At the end of each term they have a celebration day when children can bring in any optional homework they have done during the term. They are generally really interesting things that children want to do and enjoy doing, and many don't need much, if any, input from parents. When the 'I'm bored, what can I do?' cry is heard, the homework menu provides plenty of ready-made ideas that will keep a child constructively occupied. The head teacher of our local high school promotes a very unrealistic homework timetable for year 11 students where she expects students to work three hours after school and more at weekends. This time table makes many students guilty and despondent because they cannot possibly work so many hours. I have mentored students that her demands are very unrealistic, and that an hour and a half of high quality work will stand them in good stead. I think it is a problem of pointless homework. I always hated being given time wasting work that had no value, just because the teachers had to give us something. Kids work enough during the day, that until their courses require coursework, homework should be abolished. It's making me laugh all these comments about homework and all the stress, and even more laughable when people say there should be no homework, as when I was at school I coped, sometimes it was stressful but that is the point, school is not meant to be easy! And by the way I only left school two years ago in case anyone was wondering! Imagine, expecting children to do homework at home. Surely the best way to resolve the problem would be to extend the school day by two hours and let the teachers supervise homework that is set. I fact if the children bring washing equipment, a sleeping bag and a bit of food perhaps the teachers can look after them all week. This would not only mean the parents not having to take any responsibility for their child's education, but you could also clearly call the teacher to account when the child does not achieve the required standards by the end of the year. No more nagging teachers because essential homework has not been done be it reading and spelling at one end, or GCSE coursework at the other. What a solution. Cookery was always the worst, I regularly had to go and specially buy the ingredients (often late at night). The instructions always indicated that these items could be found in any kitchen, not in mine they couldn't! A full time teacher will work from eight to maybe five at night then they are expected to mark work some time after that. It's easier to do that when they have a routine. If kids get into a routine of doing things then it makes life so much easier. As a university student I have to have a routine of work for assignments then I'm expected to keep fit for my course as well. It's so much easier when you just do it. It causes stress only when the kid doesn't want to do the work in the first place and the parent pressurizes them to do it. The classic your not going out until you've done the work still rings in my ears but that's what I've taken into Uni and that's what I'll keep to. Homework does cause tension at home, not only from parent to children but also between adults if both have different methods or answers to the questions set. Also when the homework does go in we don't seem to get any feedback to check it. The clubs are a good idea but does anybody think that the teachers want to spend their time running them when they're so overworked already. Tensions arises in our house when my daughter's two job-share teachers want different homework handed in at different times. Try and get her to do homework on a Wednesday night when it is a different teacher on Thursday, and equally doing the other teacher's homework on a Friday or Sunday. Doesn't make for good homework routine. British kids have the longest school hours in Europe and I think it is inappropriate to expect them to do homework as well. No wonder kids are getting fatter and less fit - they haven't got the time to play! I lived in a small house with five younger brothers and paper thin walls. Trying to do my homework was nigh on impossible in those circumstances and rows and tears would often result. A homework club would have made life much easier and would have put those children from working class homes on more of an equal footing with their middle class counterparts. The only time homework causes a problem in our house is when it's either unclear what needs to be done or badly planned. We had one instance in November where science homework was given on a Monday, to be handed in on Friday - the work was to create a sundial and mark the position of the shadow morning, noon and afternoon. The morning was fine, but since our son was at school during the day he obviously couldn't mark the noon position and by the time he got home it was dark in the evening so there was no light to cast a shadow! Madness. Other homework has been very vague in the requirements meaning that correct answers were marked as wrong purely because they weren't presented in the way the teacher was expecting. Not so much a source of tension for us, because I do take a hands-off approach most of the time and hope that the doing or not doing of homework is a life lesson itself. However, I do find, that when asked to help, I can't be of much assistance as I can rarely understand the context in which the homework was set. "Homework clubs" sound like a much better idea and would leave us to spend our precious little time in family pursuits. This article is so true. My brother is always in fight with my mom about his homework. It's not ordinary homework that causes the most traumas - it's the dreaded art projects that usually involve making something creative out of a shoe box! It's not ordinary homework that causes the most traumas - it's the dreaded art projects that usually involve making something creative out of a shoe box! My kids are somewhat artistically challenged and unfortunately for them their parents are worse than useless at these things. I live in dread of the day we have to take these things into school and I see the amazing creations that all the other kids have - obviously the work of the parents! Maybe there is a good business idea for someone to do these things for harassed parents - I'd pay handsomely to take that drama out of our lives and I really don't think that my kids' education would suffer all that much!